For superior performance in all applications. In use for over 40 years under the most demanding conditions, Hyperboloid technology has proven itself to be the leading design for integrity and reliability. 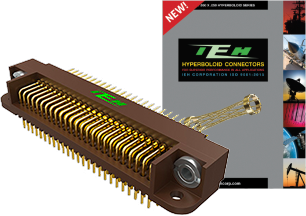 On avionics platforms, military and commercial aerospace equipment, engine control systems, missiles and torpedoes, vehicular electronics, satellites and rocket launchers, medical devices, industrial and environmental controls, test equipment, PGA sockets and countless other rugged applications, Hyperboloid has lived up to its promise of the highest reliability connector available. Read more about what makes hyperboloid different. The highest quality interconnects in a cost-effective structure. Please contact us for a quote. Put our decades of connector design experience to work for you. We can custom design a hyperboloid connector for your specific application. Since 1941, IEH Corporation has been manufacturing superior products for demanding applications. Whether it’s printed circuit board connectors, signal or power contacts, or custom interconnects, our focus is delivering the right connector solution for your application. Our interconnects and contacts employ hyperboloid connector technology, an advanced, proven interface designed specifically for the most stringent requirements and harshest environments.